We usually all get home around 5:45, and our son typically wants to eat by 6:00 pm which leaves a whooping ~10 minutes to get food together after shoes are off, cars unloaded, etc. Crockpot meals are great for cooking while you’re away and being almost ready to serve when you finally arrive. Yet I find them, especially meats, are a challenging one for me because everything ends up so similar in texture. Also, the ones where you precook elements or it cooks in three hours would definitely have to be regulated to weekend only meals. This one stood out in terms of flavor and easiness to prepare, and we’ve already made it twice in about two weeks! Insert slow cooker liner or spray slow cooker with cooking spray. Trim any significant fat cap off of the pork shoulder. Put pork in the bottom of the slow cooker. In a large measuring cup or medium bowl mix together onion, garlic, honey, ketchup, soy sauce, brown sugar, sesame seeds, pineapple and red pepper flakes and pour it over the pork. Cook on low for approximately eight hours (I’ve left it for closer to 10 hours, and it was fine) until pork is completely cooked through. Remove pork from the slow cooker and shred. 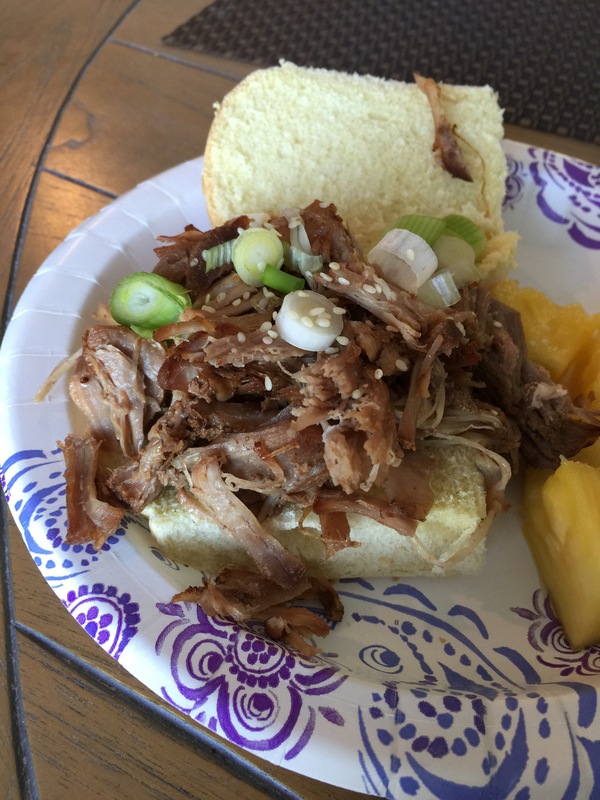 Notes: The original recipe then mixes the cornstarch and water together in a small bowl and slowly stirs it into the sauce remaining in the slow cooker, covering it with the lid while shredding the pork. I have just pulled some sauce out and reduced it in a small saucepan by bringing it to a boil and letting it go for a bit until the liquid decreases by almost half. Either option works!